Certified in Public Health Exam Review Guide will prepare you for the Certified in Public Health Exam administered by the National Board of Public Health Examiners. Addressing the most up-to-date public health tasks, this book will pave the way for your professional achievement in the field. Each chapter provides a review of critical content (tasks, references, and cases studies and/or vignettes), allowing you to test your practical knowledge. Answers are explained, allowing you to obtain a fuller understanding of the content presented. Together, the editors and authors possess years of academic experience creating interdisciplinary, dynamic, and visionary learning opportunities for public health students. 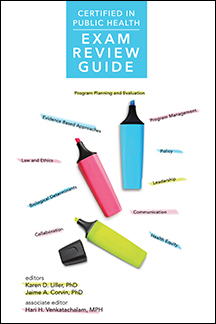 "The new, Certified in Public Health Exam Review Guide is an excellent complement to the review questions sets that are provided by ASPPH. I've had the opportunity to speak with several individuals about the exam and recommended that they purchase the book as an ideal way to prepare for the exam." - Richard S. Kurz, PhD Board Chair, National Board of Public Health Examiners. This book is print on demand and will take about 10 business days to arrive at the destination.